Eden Harper is delighted to be supporting Brixton Windmill's 'Flour Power Fund', which is looking to raise money in a bid to get the windmill grinding again by 2016 - its 200th anniversary! Local residents' group the Friends of Windmill Gardens have launched their big public appeal for £20,000 of funds, and aims to gather the cash in £5,000 stages. The objective is to sort out the best way to produce flour without affecting the many free public open days and school visits to Brixton Windmill. The windmill was initially built in 1816 and was leased to the Ashby family the following year. The mill was worked by wind until 1862, when the business was moved to a watermill at Mitcham. The sails were removed in 1864 and the windmill became a store. In 1902, the lease expired and a steam engine was installed in the windmill - later replaced by a gas engine! The windmill supplied wholemeal flour to many West End hotels and restaurants - and was saved from demolition after the war. 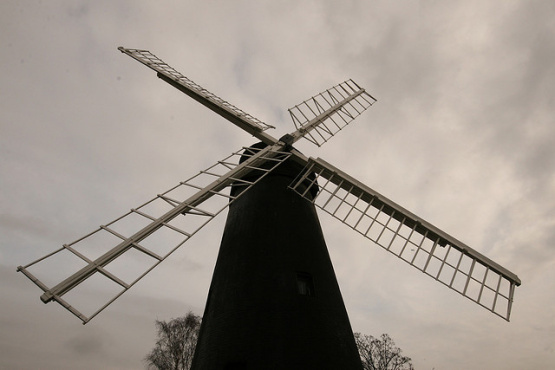 The windmill got a makeover by London County Council in 1964 and new sails were fitted and better machinery installed. The mill opened to the public four years later and was passed over to Lambeth Council in 1971 - where it's remained ever since. The mill has been restored a couple of times since in the seventies and eighties, and was placed on the 'Buildings at Risk Register' 20 years ago. The Friends of Windmill Gardens, which is looking to raise the money for the Flour Power Fund, was formed in 2003 and since a number of grants have been awarded to Lambeth Borough Council to help repair the mills and gardens. A £2,000,000 restoration plan was put together with the help of Horniman Museum and the Society for the Protection of Ancient Buildings. Since then, The Heritage Lottery Fund granted £397,700 towards the restoration, with Lambeth Council and the Friends of Windmill Gardens also contributing towards the restoration of the mill, which cost £581,000. The restored mill was officially opened in May 2011 by Chuka Umunna, MP for Streatham. And now the Friends of Windmill Gardens need more help to ensure that the windmill can keep offering the public valuable education days. working with local bakers – also potential partners. We hope that you find the time to support the fund - it's well worth it!